UH Mānoa continues to garner national recognition for its efforts toward cutting energy usage and lessening its dependence on fossil fuel consumption. The building that houses the Center for Microbial Oceanography: Research and Education (C-MORE) has been awarded the highest level of certification established by the U.S. Green Building Council and verified by the Green Building Certification Institute. C-MORE Hale, located next to the Biomedical Sciences building at the end of East-West Road, has been honored as LEED (Leadership in Energy and Environmental Design) Platinum for energy use, lighting, water and material use, and for incorporating a variety of other sustainable strategies. 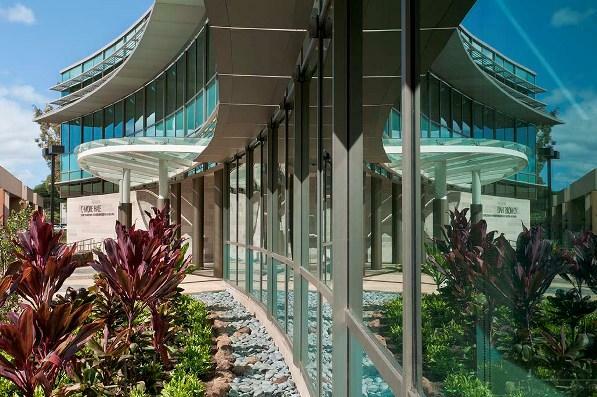 C-MORE Hale becomes the first research laboratory building in Hawai‘i, and only the eighth construction project in the state, to receive the highest level of LEED certification. Group 70 International served as lead design firm. “The C-MORE facility is an exciting and beautiful addition to our campus and exemplifies our commitment to sustainability research and practice,” said Chancellor Virginia S. Hinshaw. This is the second major national recognition for UH Mānoa in the past two months on the subject of sustainability. Chancellor Hinshaw was among a small group of select public and private sector leaders to be invited to the White House in December 2011 to highlight their energy reduction initiatives. At the White House Better Buildings Challenge, President Obama and former President Clinton endorsed efforts such as UH Mānoa’s goal of renovating half-century-old Kuykendall Hall into the first zero net energy (non-fossil fuel dependent) retrofitted building in the state. The use of 48% less potable water, compared to a conventional building of similar size and use, through incorporation of ultra low-flow toilets, automated faucets and waterless urinals. Diversion of 25,000 gallons of water from city storm drains through the implementation of an underground storm water chamber detention system. Establishment of a 2,400 square foot green roof that helps to reduce storm water runoff, reduce building temperature, increase carbon dioxide removal and provide a beautiful eco-habitat for insects and birds. The green roof contains a variety of native and adapted plants, including Aloe, ‘Akulikuli, Sedum and Portulaca. The reduction of irrigation demand by 65% in comparison to typical turf (grass) landscape typically found on campus. The landscape design incorporated dry stream beds with river rocks in lieu of turf grass, drought-tolerant planting and native landscaping like ‘Aki‘aki and Naupaka, and a drip irrigation with rain-sensing irrigation controls to reduce water demand significantly. Utilization of solar hot water heat recovery, which contributes to reduction of the building’s energy consumption by 52.2% over a standard laboratory of similar size and usage, translating into a 31.4% savings in energy costs a year. In addition, 78% of spaces in the building are considered day-lit, which saves an immense amount of energy. The primary building lighting is equipped with smart controls, in which occupancy sensors shut off lights when rooms are unoccupied and light sensors reduce the light levels according to the amount of daylight detected. C-MORE Hale won a 2011 Kukulu Hale Award from the Hawai‘i Chapter of the National Association of Industrial and Office Properties in the category New Project-Commercial/Other, 40,000 square feet or less. C-MORE is one of only 17 National Science Foundation-sponsored Science and Technology Centers. The building provides 30,000 square feet of state-of-the-art research laboratory and support spaces focused on the study of ocean microbes. Completed in 2010, C-MORE exemplifies a new direction in research facility—one that promotes interdisciplinary collaboration, transparent connectivity and representation of its research mission. For more information on C-MORE, see http://cmore.soest.hawaii.edu.